Selfie time is any time. 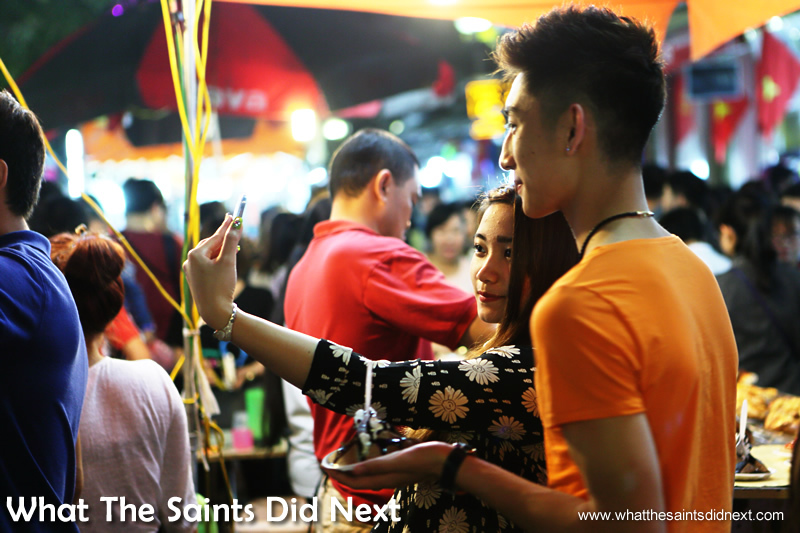 Young people enjoying the Hanoi night market. 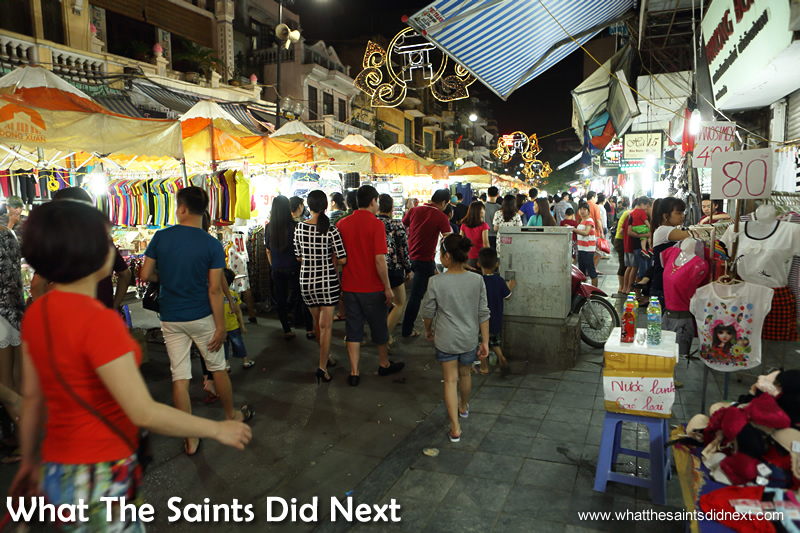 If you are considering a visit to Hanoi, Vietnam, I have to recommend the Hanoi night market as a great cultural experience for a Saturday night out. Before coming to Southeast Asia the thought of visiting a street market had as much appeal for me as a day cleaning windows; I would have found any excuse to do something else. 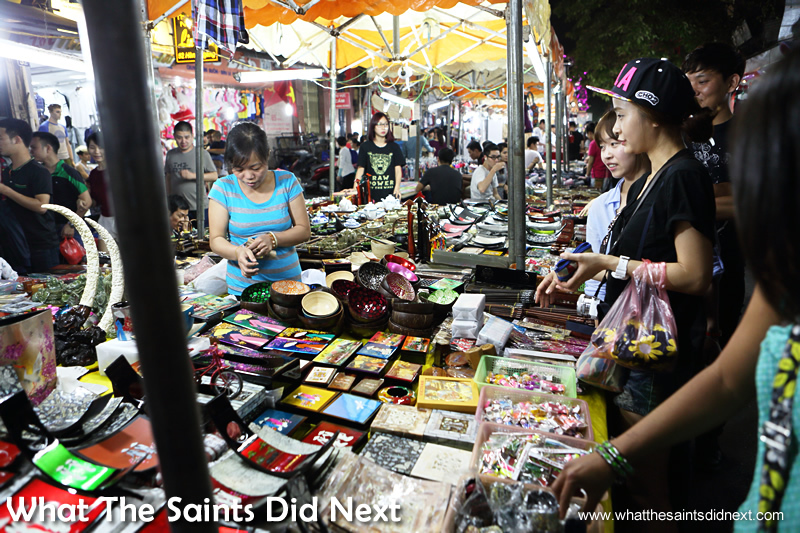 But that’s changed as markets here are a vibrant, energetic encounter with a fascinating culture. (Still not keen on the windows mind you). After Thailand and Cambodia, we are now about to sample a Vietnamese street market, here in Hanoi. It’s Saturday night, and at 6pm the Hàng Đào street is closed off to traffic and instantly vendors set about transforming what has been a traffic filled roadway into a bustling shopping walkway. Colourful and well organised stalls compete for sales. 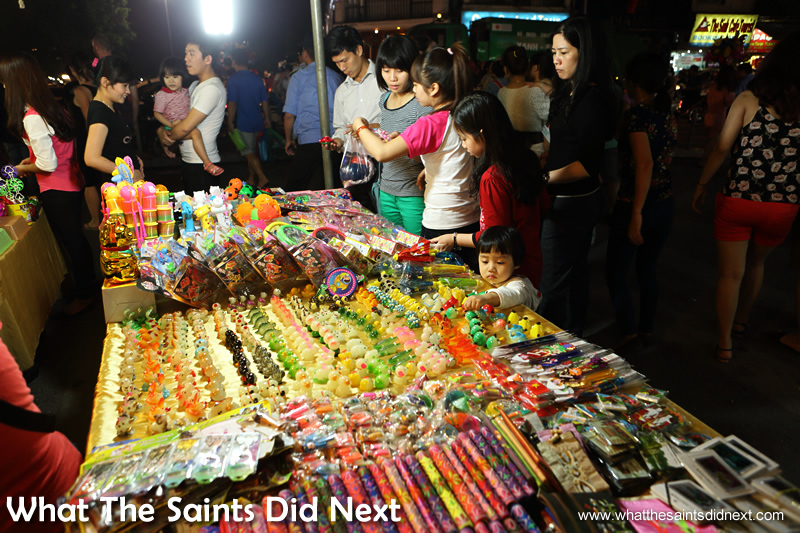 The Hanoi night market takes place on Friday, Saturday and Sunday evenings. What strikes me most about the crowd that pours in to browse are the hundreds of young people who are here, browsing the stalls, adding a youthful, stylish feel to the night. In London a few weeks ago I peeked in at a street market in Shepherd’s Bush which looked tired and outdated with just a few stragglers bumbling around. I don’t think there was anyone under the age of 40 years. This in Hanoi is completely different. 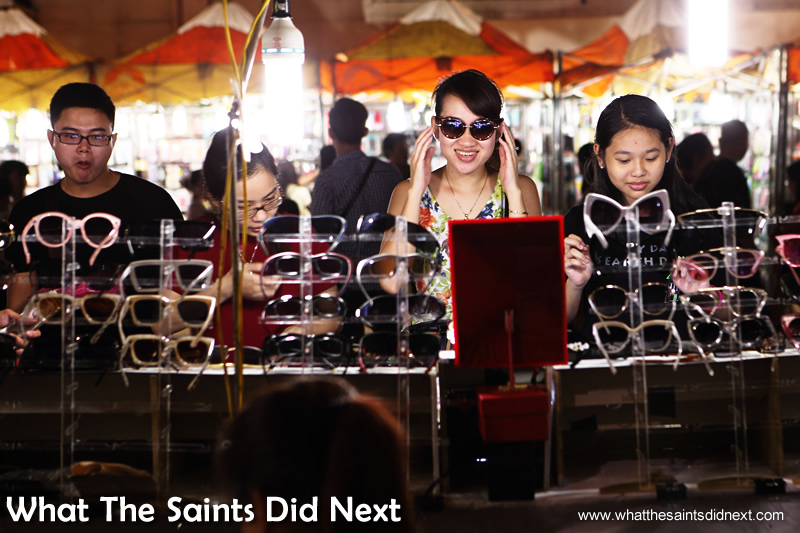 Sunglasses are very popular at the Hanoi night market. Plenty of deals on jewellery. Everyone is trendy; Asian cute fashion and smart phones everywhere. Pretty young ladies with shiny long hair glide through the crowd. It’s hard not to stare! There are bargains everywhere and it’s custom to haggle over prices. 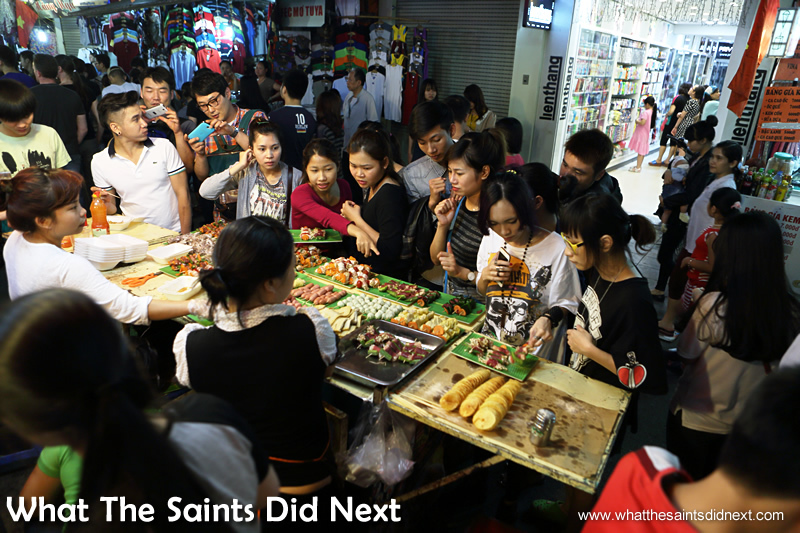 We must resist the temptation to buy, despite the smiling invitations to part with our VND – already our flight weight allowance is maxed out. 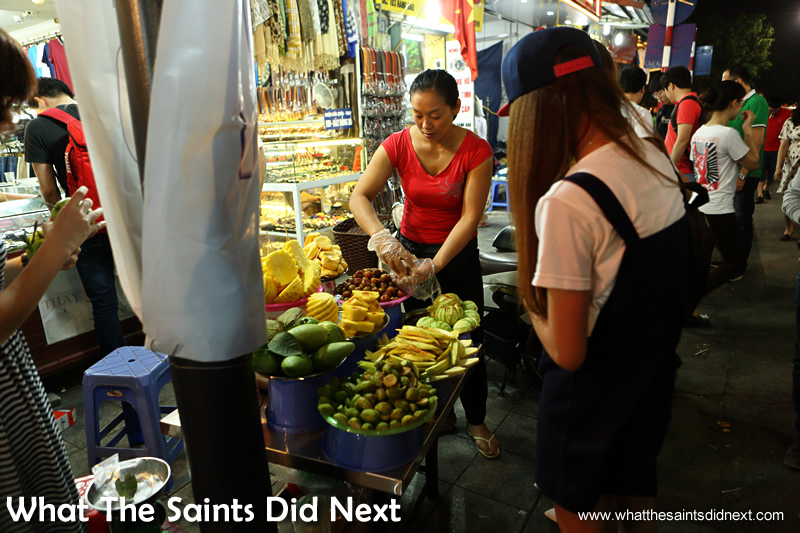 Fresh fruit is available day and night from street vendors in Vietnam. The Hanoi night market. 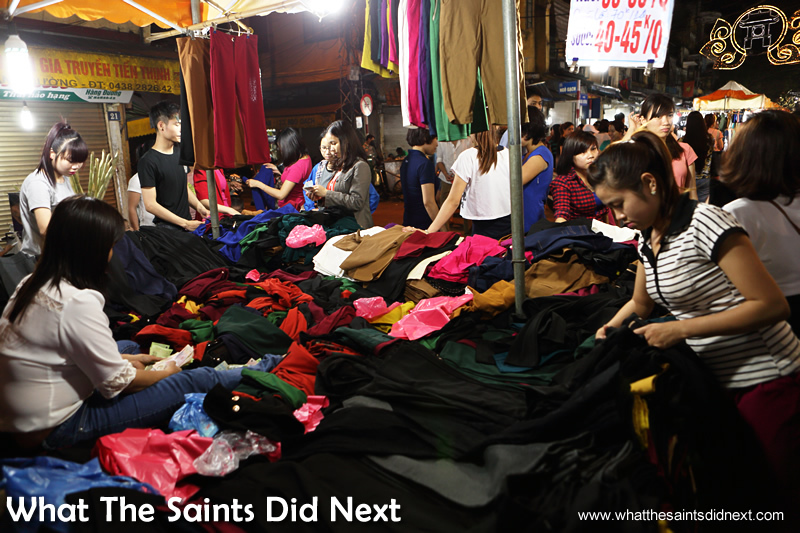 At the Hanoi night market fashion stalls don’t seem to be hindered by a lack of changing room! Fashion baseball caps attracted plenty of interest all night. While the market stalls have taken over the centre of the street, the shops on either side are all open and have taken advantage of the increased foot traffic by extending their displays onto the pavements. The stalls are all lit by portable fluorescent lights. The most popular stalls seem to be those selling baseball caps, sunglasses and jewellery. 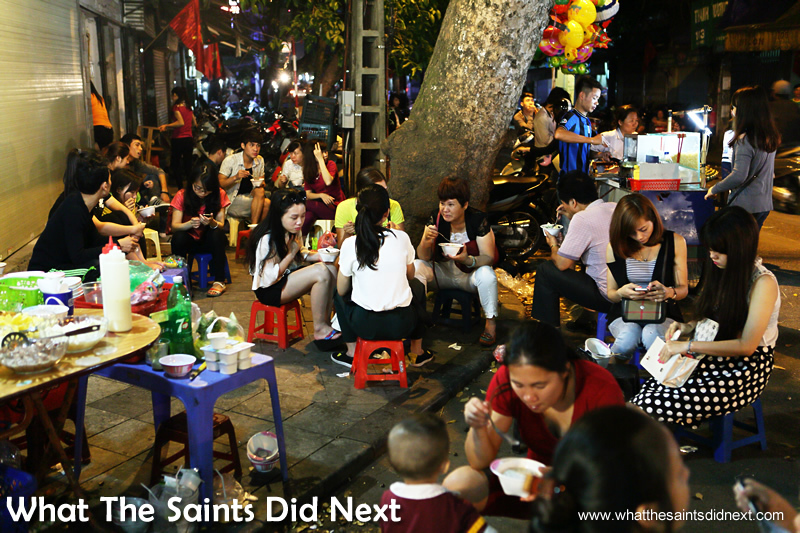 We stop at a food stall that is surrounded by eager customers, and it’s easy to see why it’s so popular. Everything looks clean and fresh and the smells are advertising delicious promises. Raw food on skewers are laid out, juicy cuts of meat mixed with colourful vegetables; customers pick a selection for their tray which is then handed over to be cooked. The whole fresh concept is bringing in a roaring trade for the vendors, but it’s the cleanliness and expert customer service that is key. These guys are giving a live demonstration of small business excellence. It’s also proof that fast food doesn’t have to be unhealthy. Proof that fast food can also be exciting and healthy. 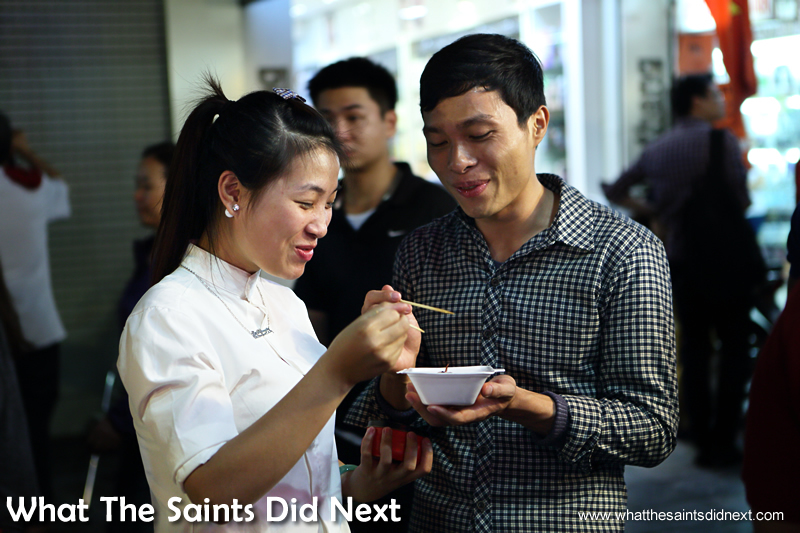 This is our selection being handed over for cooking at the Hanoi night market. This stall stayed busy until it sold out at the Hanoi night market. The chef, busy at the stove under the counter at the Hanoi night market. While Sharon is waiting for our food order to be cooked, I’m standing to one side people watching, and can’t help noticing how romance is all around. Young couples out for the night, sharing a take-a-way or a dessert, snuggling close for selfies, all the while oblivious to the crowd around them. Even when I lift the camera to steal a picture of a young man feeding his girlfriend (or wife even) his chocolate dessert, they are so caught up in their moment, I’m completely ignored. 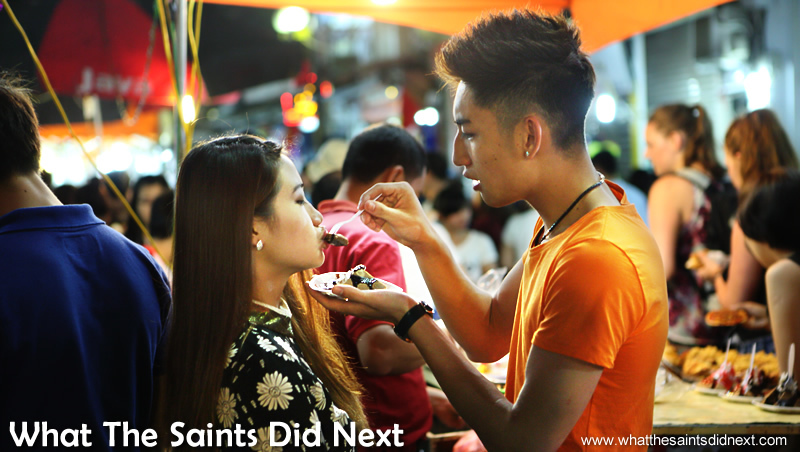 A tender moment at the Hanoi night market, on Hàng Đào street. I can imagine if I tried that with Sharon she would want to hold the fork herself, in case I spilled the food on her clothes! Oh to be young again! Continuing our slow stroll we finally reach the end of the 700m long street, well over an hour later and then turn around to come back down to view the stalls on the other side. 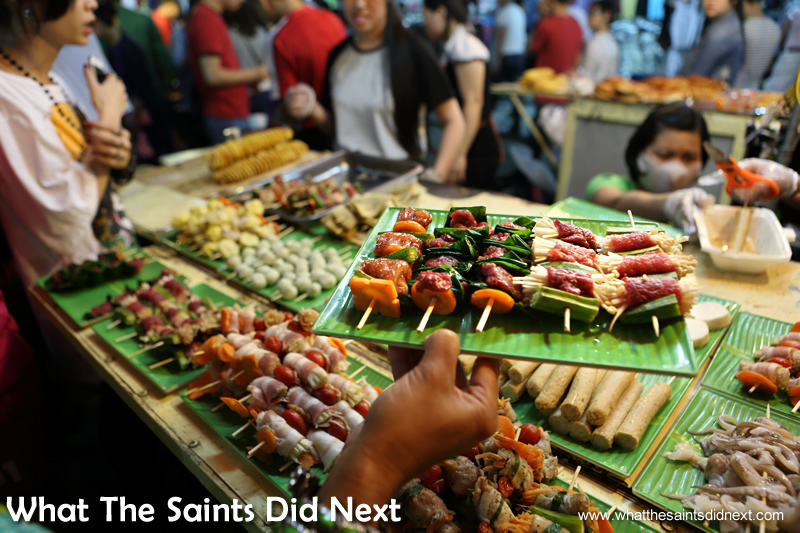 It doesn’t take much to make a restaurant in Hanoi – where better to eat street food! 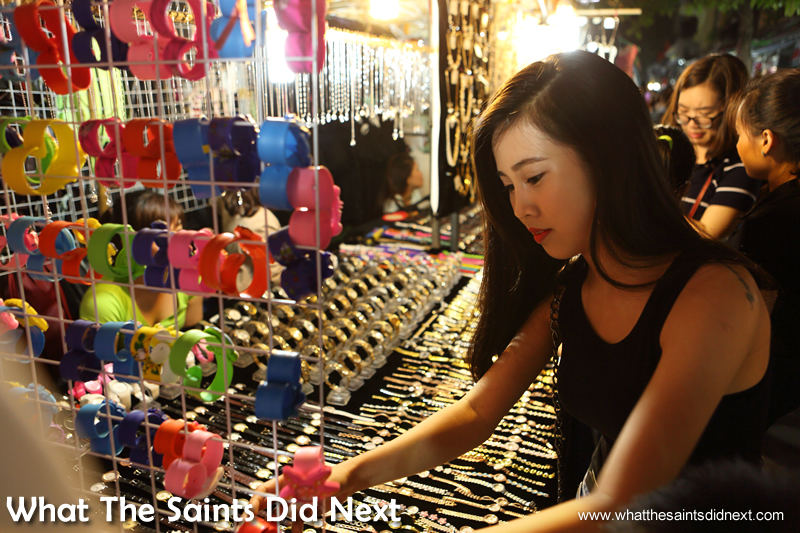 The Hanoi night market is great fun on the weekend. 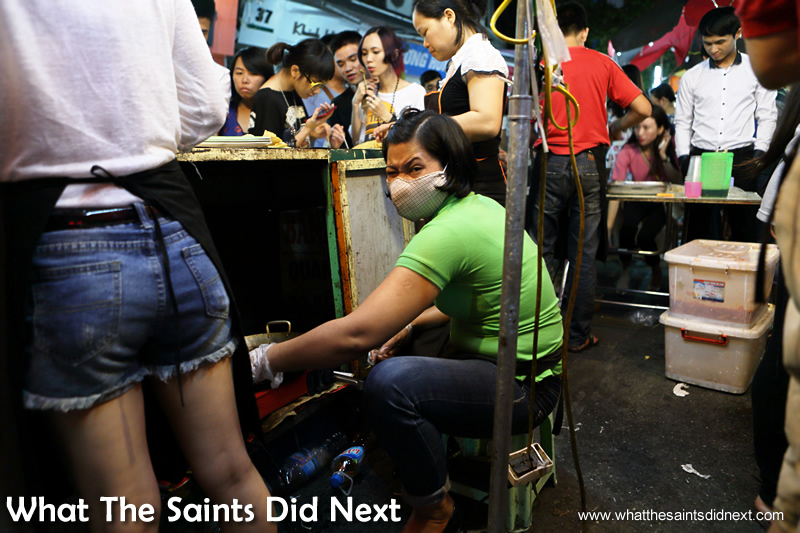 Another food seller at the Hanoi night market with super tasty looking food and the smells to go with it. 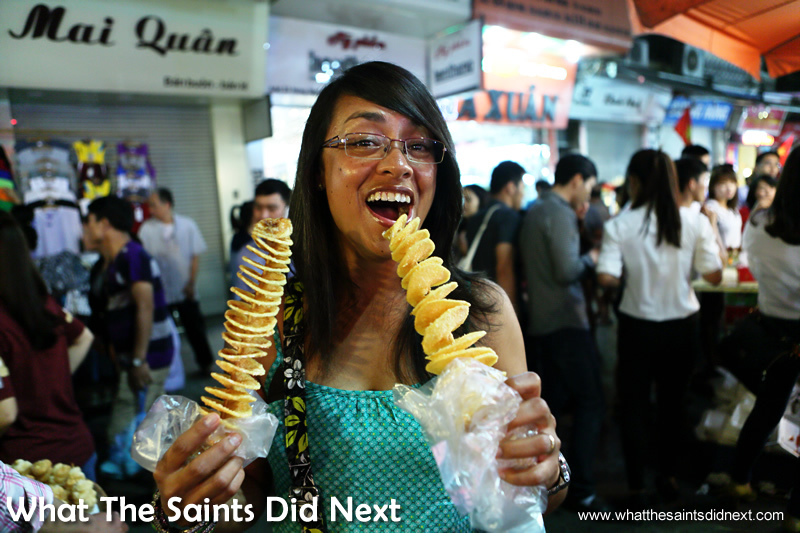 Trying out a potato on a stick, snack – very tasty at the Hanoi night market. Another happy couple sharing a night out. I’m fascinated by the incredibly friendly and relaxed atmosphere that sits so easily alongside the air of excitement in the crowd. What makes this so unique is the absence of any tension that usually rears it’s head in a large crowd out at night, especially with young people. Alcohol isn’t being obviously promoted but it’s being consumed at the little informal street bars, which are no more than a collection of plastic stools and a coffee table. Despite this there is no rowdiness, no one is loud or intimidating. This feature of Southeast Asia’s culture, the respect for others, makes events like these enjoyable for people of all ages, locals and tourists alike. 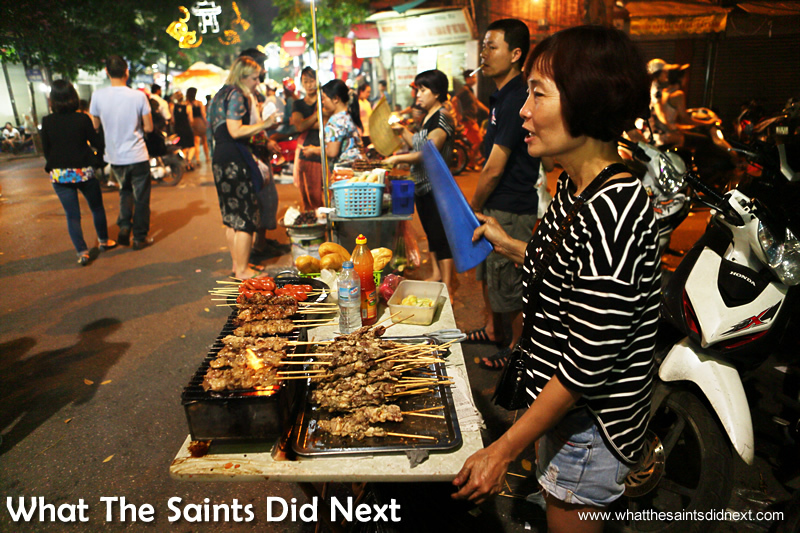 The Hanoi night market should definitely be on any visitors list of things to do in this amazing city. It’s open every Friday, Saturday and Sunday evening from 6pm. 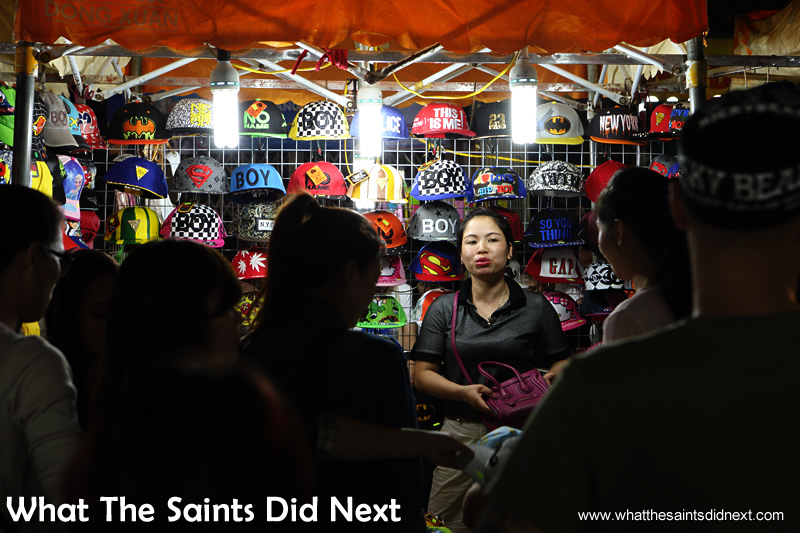 Bargain hunting in the Hàng Đào Hanoi night market. Can’t beat their cheap beer and troi tau! !